What if you had a guidebook for navigating corporate life? An executive career can bring wealth, prestige, and fame. But it also comes with unique challenges. Vishal Agarwal has written an essential handbook for business leaders to successfully negotiate the high-stakes complexities of any corporate culture. Give to Get illuminates rarely discussed challenges for those in business leadership roles, from overcoming "new guy syndrome," to creating a stakeholder map, taking your credit to the bank, finding your why, earning trust and building support, and overcoming burnout. Drawing on decades of experience, Agarwal shares essential strategies to help executives avoid the most common causes of failure at any stage of their career and replace them with skills every corporate superstar needs to master. Filled with allegories, personal stories, and memorable "Vishal-isms," this is a must-read. 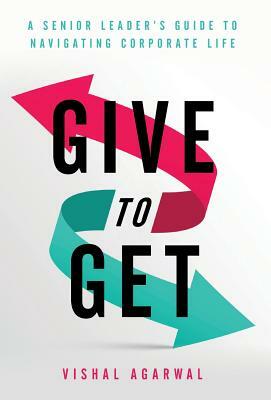 Whether you're a senior-level decision-maker or on your way to becoming one, Give to Get will help you take charge and navigate to success.